Nanyang King's Gate Hotel (Canton) is constructed and decorated in accordance with the five-standards with the joint investment of Guangdong Nanyang king's Gate Hotels Co. Ltd and the Military District of Guangdong Province, with total investment amount exceeding RMB 600million yuan. Located in the central part of Tianhe District, Guangzhou City, the hotel faces the scenic and charming Baiyun Mountain. It is only 45minutes' drive to the New Baiyun International Airport and five minutes' drive to the Guangzhou Eastern Railway Station. The Hotel adopts the famous French Versailles artistic style; the palace-style lobby is splendid and shining,extremely luxurious and noble, all of which exhibit the royal grandeur. The operation area of the hotel surpasses 40,000 square, Triumphal Palace is 25 stories high, and Louvre is 8 stories high. It has 468 deluxe guestrooms of different varieties which are elegant and noble, equipped with Internet access, computer and large-screen TV set, the bathroom of the guestrooms are equipped with luxuriant steam room and imported massage bathtub, which can get rid of your travel fatigue and tiredness, make you feel at home. The Hotel is equipped with the matching facilities such as Royal Chinese Restaurant, Louis Western Restaurant, Lobby Bar, Multifunctional Large-SCALE Conference hall, Golden Hall Club, heath Center, Fitness Center, Billiard Room and Table tennis Room, etc. With the operation of various kinds of entertainment facilities, the hotel can meet different demand of the guests, and provide one-stop honorable guest service. 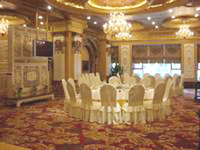 Nanyang King's Gate Hotel (Canton) is a chain hotel of Zhuhai Nanyang Seascape Hotel. With solid capital and rich international management experience, the company has successfully operated a number of stared hotels across China.